Tatheer Ali is a policy analyst with a passion for multilateral engagement and global advocacy. She is particularly passionate about engaging on issues of economic inclusion, diversity, and social cohesion. She has held several positions in the Federal Government of Canada, including the Privy Council Office. Currently, she works at Immigration, Refugees and Citizenship Canada providing strategic and horizontal policy support in the Strategic Policy and Program Sector. Previously, she worked as a Research Assistant at Carleton University, Ottawa, examining the role of partnerships between states and international bodies in managing international migration. For her work as a Research Assistant, she was awarded the I-CUREUS Research Scholarship by the university’s Vice Provost Office. In her free time, she volunteers with local immigrant serving organizations and mentors immigrant youths. Tatheer additionally holds a Masters of Science in Migration Studies from St. Antony’s College, University of Oxford, UK and a Bachelors in Public Affairs and Policy Management with a specialization in Economics and Development Studies from Carleton University, Ottawa. Celine Caira is an Economist and Policy Analyst with experience working in municipal and provincial governments, NGOs, and in multiple UN organizations. Celine holds a Master of Public Policy and Governance from the University of Toronto and a Bachelor of Arts Honours in Political Science, Economics, and French Language and Literature from McGill University. Celine worked at Toronto City Hall as a Policy and Constituency Assistant prior to joining the Ontario Ministry of Economic Development and Growth’s Social Enterprise Branch. Internationally, Celine assisted in the production of system-wide reports at the Joint Inspection Unit of the United Nations System in Geneva and covered biweekly press briefings and high-level events at UNTV/Radio, Information Service. Celine currently works for the World Intellectual Property Organization (WIPO) in Geneva conducting evaluations focusing on intellectual property issues. Celine’s leadership and volunteer experiences span from administrative work to social justice initiatives. She volunteered at UN Women Canada for five years and recently co-founded and set the strategic direction for UpSource, a business talent management start-up. Celine was Senior Producer and Host for the weekly current affairs radio show Beyond the Headlines (89.5FM) and was frequently published in the University of Toronto’s graduate journal The Public Policy & Governance Review. Celine was awarded the 2017 Cadario Fellowship in Public Policy, UN Women Canada Volunteer of the Year in 2012, 2013, and 2015, and was a finalist at the 2009 Toronto Student Film Festival. Adèle is currently in her first year of her master’s Degree in International Affairs with a focus on Security and Trade at the Graduate Institute in Geneva. She completed her undergraduate Degree at the London School of Economics, graduating in 2017. Her academic area of specialisation is in global security and self-determination through the lens of intelligence and diplomacy. She has a regional focus on the Middle East and North Africa. Previously, Adèle has been involved in advocating for greater rights of the stateless Bidoons of Kuwait, researching state-sanctioned terrorism in Rwanda and Burundi with Human Rights Watch, and is currently working with Independent Diplomat as a Programme Assistant covering Western Sahara and Palestine. Her current professional focus is on bolstering the legitimacy of Non-Self-Governing territories at the United Nations, particularly the Human Rights Council. As a third culture kid, Adele has lived and travelled in South Asia, East Asia, the Middle East, sub-Saharan Africa. She is originally from Chelsea, QC, within the greater Ottawa capital region. She speaks English and French fluently, as well as basic Arabic and Spanish. Adele is thrilled to be representing Canada as part of the official delegation to the OECD Forum and looks forward to hearing from Canadian youth throughout the consultation process. Matthias Leuprecht is a Bachelor of International Economics (BIE) student at the University of British Columbia (UBC) with a keen interest in public policy: he is on the executive of the UBC Environmental Policy Association, the editorial board of the IONA Journal of Economics, and the Policy Officer of UBC Young Liberals of Canada. Prior to attending UBC, Matthias was a member of the Canadian High-Performance Fencing Program, winning a team bronze medal at the 2015 October European Circuit as part of the Canadian National Fencing Squad. He is also a five-time Ontario fencing champion and national medalist. Matthias was also the Co-President of the largest youth business organization in Eastern Ontario, earning an Award of Excellence at the 2016 DECA International Career Development Conference. In addition, Matthias was a member of the youth council for the United Way of Kingston, Frontenac, Lennox and Addington where he worked on policy initiatives with the goal of ending youth homelessness. Matthias also spent two summers working for the Member of Parliament for Kingston and the Islands. Matthias was Premier of the 2016 Legislative Assembly of Ontario Model Parliament and Secretary-General of the 2017 Kingston Model United Nations. Originally from Kingston, Ontario, Matthias is bilingual in French and English, and has been featured with TEDx. In March 2018, Matthias was elected as the Student Senator from the UBC Faculty of Arts, and as of April 2018, Matthias will be working with the National Research Council of Canada. Sarah Berube has been recruited by the Advanced Policy Analysts Program (APAP) for 2017-2019. During these two years, she will be rotating between the three federal central agencies, namely Treasury Board Secretariat, Finance and the Privy Council Office, and her home department, Global Affairs Canada. She has a deep interest in public institutions and international relations. She worked at the National Assembly of Quebec as a page and then as a student researcher in Parliamentary Law and Procedure. She was fortunate enough to be an intern twice for Quebec representations abroad, first in the Public Affairs Division of the Quebec Government Office in Washington and, second, in the Economic Affairs Division of the Quebec Government Office in London. She also served as the coordinator of the Research Chair of Canada in Environmental Law at Laval University. She holds a M.A. in International relations and a B.A. in Public Affairs and International Relations from Laval University. Garima’s academic endeavors centre on minority-identifying women. At McGill, Garima is heavily involved in student life both as a teammate and a leader. 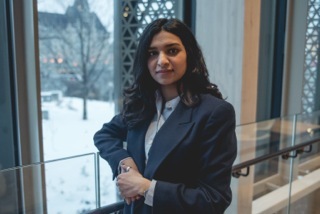 She has competed with McGill’s Model United Nations delegation team since her first year, and was most recently the Chief of Staff of SSUNS – Canada’s biggest Model UN conference for youth. She is also on the Executive of McGill Women in Leadership, where she works with her team to secure sponsorships with socially responsible businesses both locally and internationally. Recently, she was elected as the Arts Representative to McGill’s student government, a position she is eager to undertake. In Montréal, Garima is a speech and debate coach at an all-girls school. 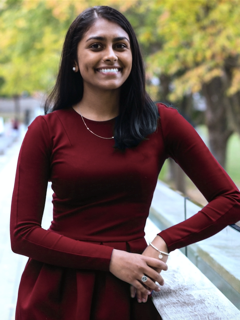 Garima is active in the Canadian government, having volunteered with her Member of Parliament and been named a Canadian Daughter of the Vote in 2017. On International Women’s Day last year, she delivered a bilingual address in the House of Commons, calling on the federal government to improve immigrants’ accessibility to the French language and la Francophonie in Canada. Currently on exchange at Sciences Po in Paris, Garima is looking forward to attending the OECD Forum in her new home!